Check out the figure below. 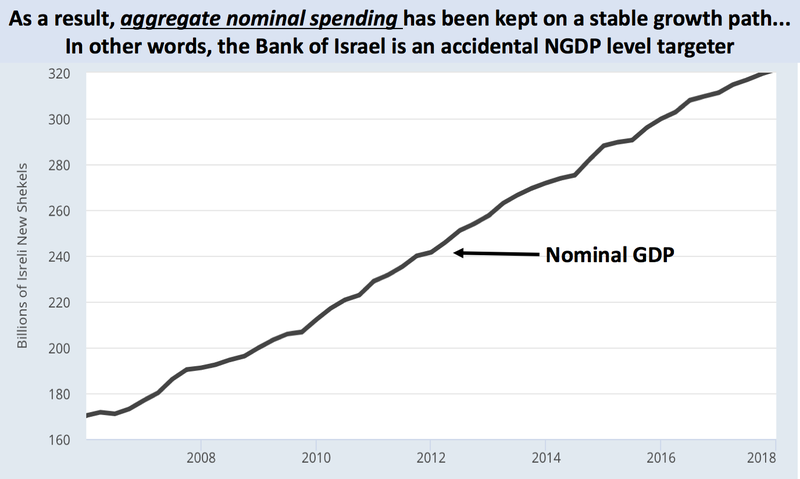 It has nominal GDP plotted for three countries, normalized to 100 in 2007. The first country (black line) has kept nominal GDP on a stable growth path over the entire period. The second country (red line) saw its nominal GDP growth path permanently decline in 2008-2009 but has since stabilized its growth rate. 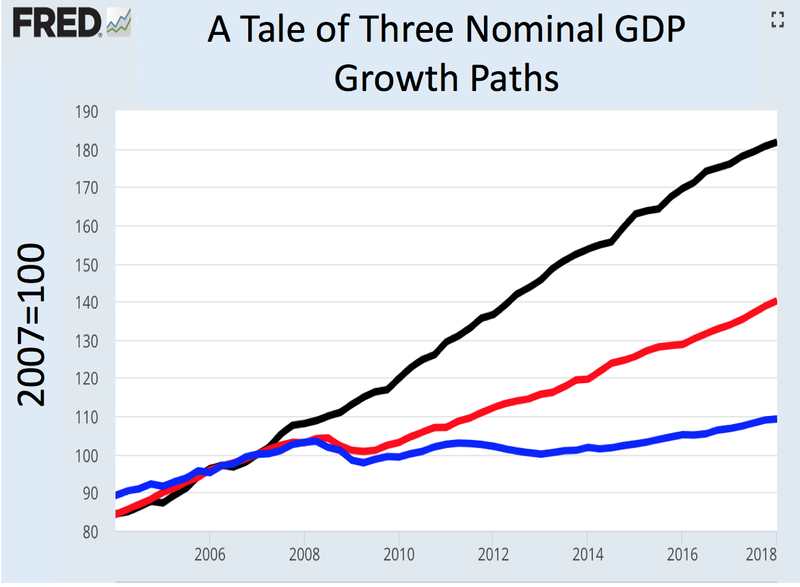 The third country (blue line) had its nominal GDP growth path collapse and has only recently seen it grow past its its 2008 peak value. 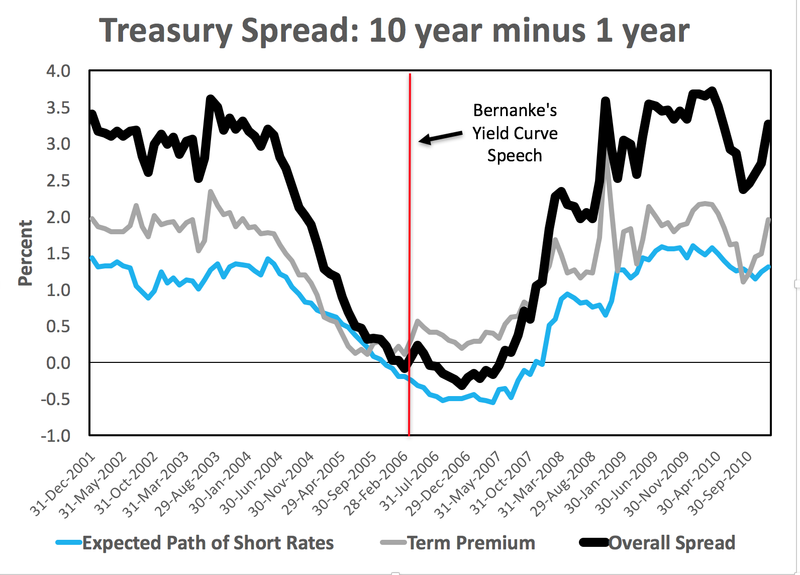 So we see three very different paths of a nominal variable that should be controlled by monetary authorities over long periods, like that depicted in the chart. 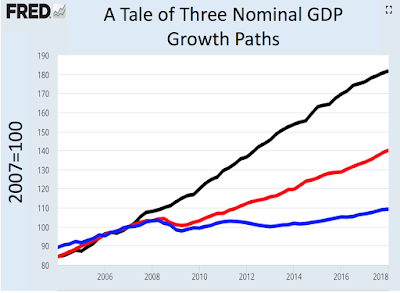 Consequently, not only are we seeing a tale of three different nominal GDP growth paths, we are also see a tale of three very different central banks policies. Can you guess what countries are represented by the three different lines? Sovereign banking will not happen in Switzerland. The referendum to end fractional reserve banking and turn all money creation over to the Swiss National Bank (SNB) central bank failed by a wide margin on Sunday. This rejection is not a surprising result, given the polls going into the vote. There never was much chance the so-called Vollgeld plan would would pass. Still, the sovereign money referendum was useful in that it generated new discussions on the benefits and costs of opening up the central bank's balance sheet to the public. In the United States, there had already been some debate surrounding the opening up of the Fed's balance sheet to non-bank financial firms in response to the financial crisis. Depending on who you asked, this "creeping nationalization" of financial intermediation was either concerning or a step in the right direction toward safer money. The Swiss vote was good, therefore, in that it further fleshed out some of the arguments for and against central banks becoming more like a regular bank. Among those arguing for sovereign money or something like it were Martin Wolf, Ryan Avent, Matthew Klein, Martin Sandbu, Morgan Ricks, and the positive money folks. Some of those arguing against it include Carolyn Sissoko, Jo Michell, Sri Thiruvadanthai, Cullen Roche, Scott Sumner, and George Selgin. The appeal of deposit accounts for all at the central bank is understandable. They would be safe and end private bank runs. But sovereign money is not costless. It would bump up against some big problems that sovereign money advocates either ignore or dismiss too easily, as noted by the critics above. In this post, I want to highlight three that I think are especially under appreciated : the knowledge problem, the public choice problem, the tradeoff problem. The knowledge problem, as fist noted by F.A. Hayek, is that the information needed for successful centralized economic planning is distributed widely among households and firms. It is knowledge a central planning authority needs but cannot obtain. In this context, it is the central banks inability to know where and how much money creation is needed. Money, currently, is the byproduct of many decentralized decisions among a large number of borrowers and lenders in very different circumstances. Specifically, banks create money through loans to businesses and households in various locations based on local, idiosyncratic economic conditions. To believe this complex process could be easily replaced by a central bank committee deciding how much money should be created is incredulous. But it gets worse. Under a sovereign money regime, estimating the amount of money needed would actually become more complicated. This is because financial firms wanting to originate loans would need 100% reserve backing. Money, in other words, would be needed for both transaction purposes and for loan-backing purposes. So not only would the central bank need to know where and how much transaction money demand there was, it would also have to know where and how much loan-driven demand for money there was. 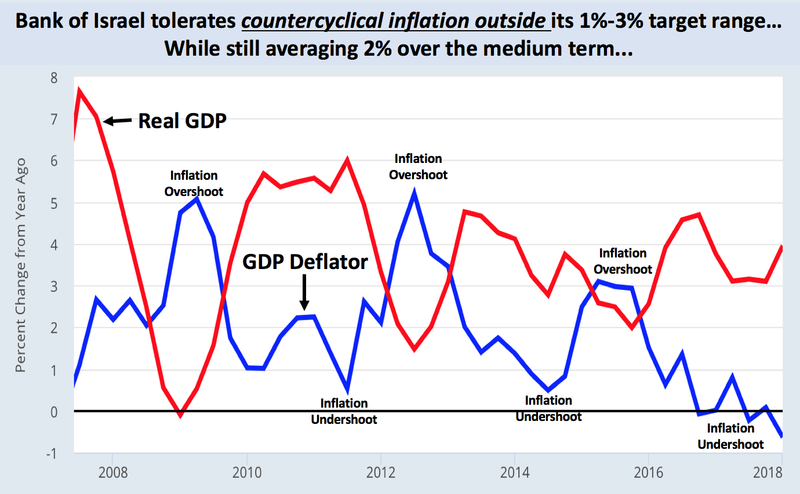 It would be very easy for central banks to get monetary policy wrong. Central bankers, in short, would need near omniscience to do their job well in a sovereign money regime. Given these Herculean requirements, it is easy to understand why SNB officials were so adamantly opposed to the sovereign money proposal. Public choice economics tells us that the fallible people who often cause problems in the private banking system are the same fallible people that work at central banks. They may mean well, but like all humans they too desire to make themselves better off and respond to incentives, sometimes unconsciously. One can, for example, look to growing Fed budgets or the Fed's influence on research as potential examples of public choice economics at work. Now take a central bank and turn it into the sole creator of money, as sovereign money advocates desire, and see what happens to central banker incentives. This development would mean a massive expansion of the central bank's balance sheet and complete control over money creation. 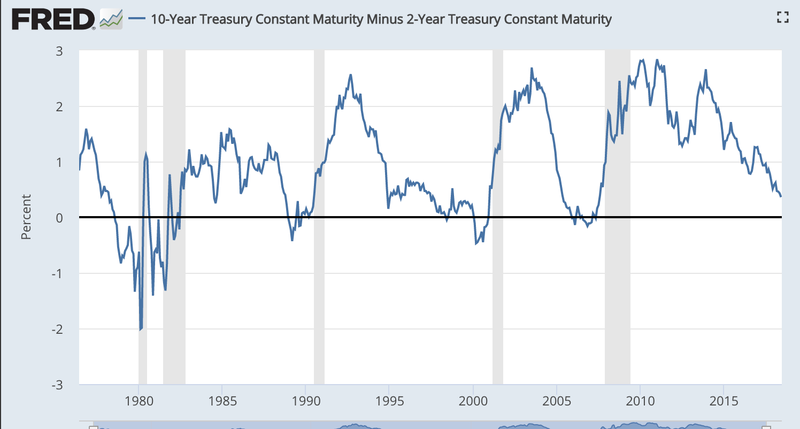 If, for example, the Fed opened up its balance sheet to all current retail holders of money balances--the M2 money supply--its balance sheet would expand to about $14 trillion. And once the Fed opened up its balance sheet to retail investors, it probably would not stop there. For if financial firms and households can have deposit accounts at the Fed, why not non-financial firms too? Central bank balance sheets would become super sized. With such large balance sheets and the sole power to determine who gets money, central bankers would find it hard not to be corrupted. As Lord Acton famously said, "Power corrupts and absolute power corrupts absolutely." Many sovereign money fans fail to grapple with this issue. They simply assume that central bankers, with all their new power, will act like saints rather than sinners. This is an incredibly naive understanding of humanity. If private bankers can behave badly, as many sovereign money advocates note, why not central bankers when given vast power? 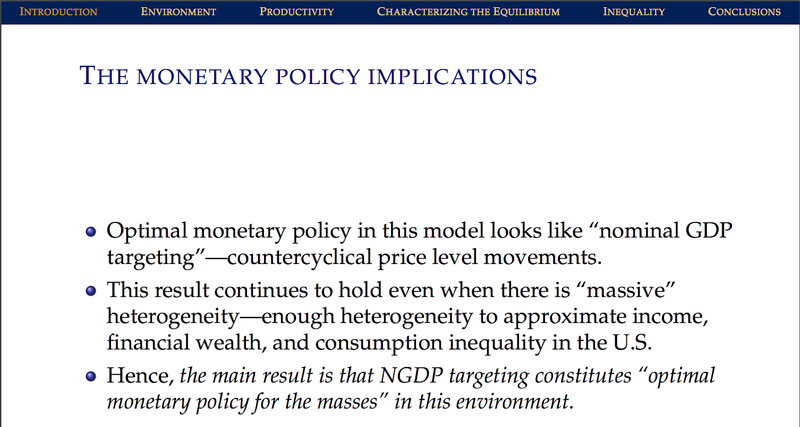 The above concerns imply monetary policy would actually get harder under a sovereign money regime. Yes, central bankers would have more control over the money supply, but they also would need near omniscience and a pure heart to get it right. It is likely, in other words, that central banking would become more destabilizing in a sovereign money regime. This third concern becomes even more pronounced if central banks continue to lend while opening up their balance sheets to the public. To be clear, sovereign money advocates want to avoid this very outcome--they want to separate credit creation from money creation--but it seems unlikely that central banks would cease lending in practice due to public choice reasons. 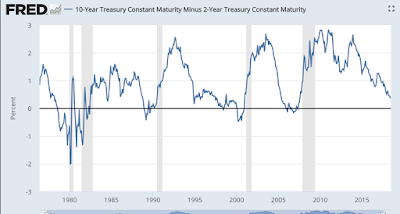 If so, then, it is easy to see central banks with their now open balance sheets also expanding their financial intermediation activities and becoming the mother of all too-big-to-fail (TBTF) institutions. Central banks, in short, are more likely to make mistakes in a sovereign money regime than in the current system. 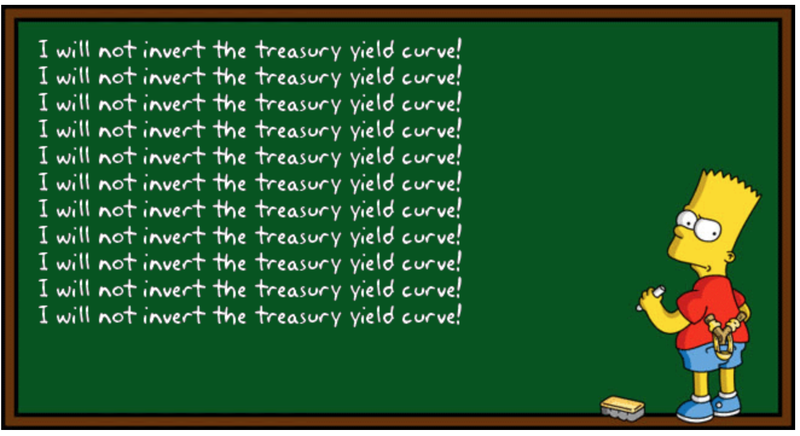 Whether that means the wrong monetary policy or turning the central bank into a TBTF institution, the temptation will be great to paper over such mistakes with higher inflation. 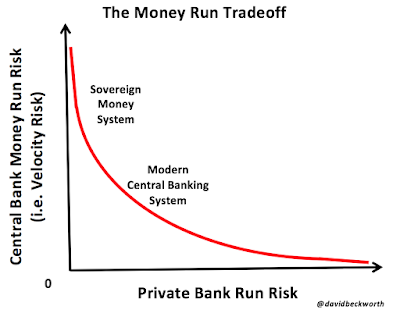 If so, society will have traded private bank run risk for central bank run (i.e. velocity) risk. That is, we would be trading off running on private bank accounts for running on central bank money because of higher inflation fears. This tradeoff is depicted in the figure below. This understanding belies a central claim made sovereign money advocates: there can be debt-free money creation. 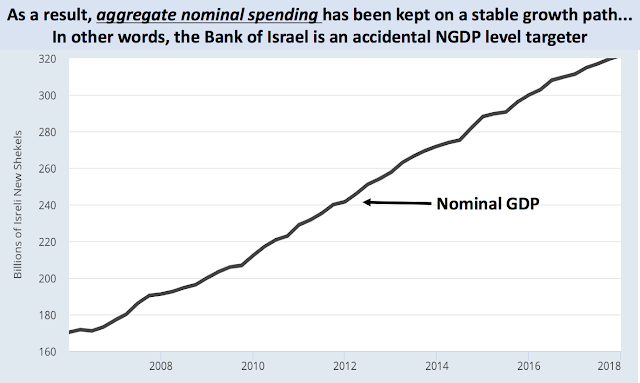 Yes, it is true a government can do helicopter drops, such as putting money into the public's deposit accounts at the central bank. But even these are implicitly a liability of the government if it cares about price stability. For it implies a commitment by the government to use real future resources—via future taxes—to keep inflation stable. This money creation, then, is a debt on future generations. For the reasons laid out above, I am not convinced that a sovereign money regime is the panacea many make it out to be. 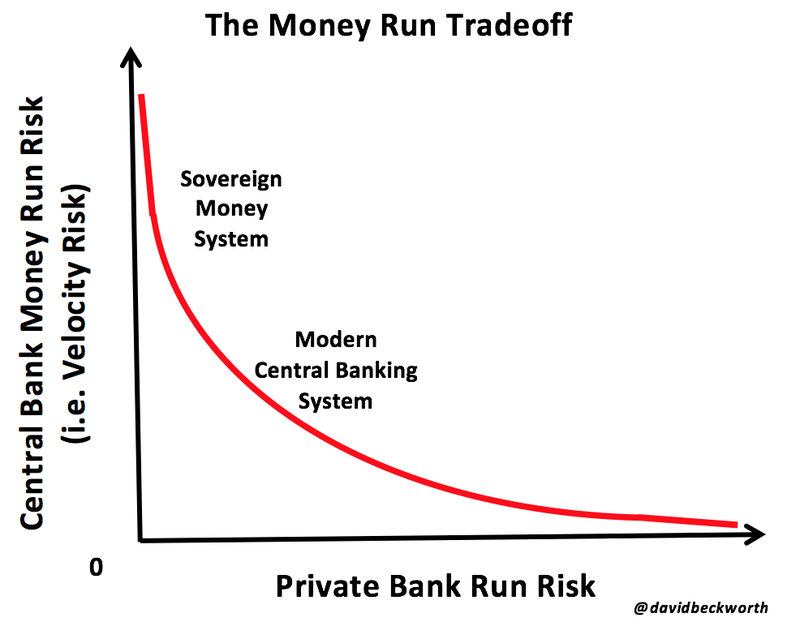 Yes, our banking system is far from ideal, but going down the sovereign money path is a step in the wrong direction. Update: Morgan Ricks responds to my post here. PS. Brian Blackstone of the Wall Street Journal and I discuss the Swiss referendum in this week's episode of the Macro Musings podcast. Listen below or via your favorite podcast app. PPS. 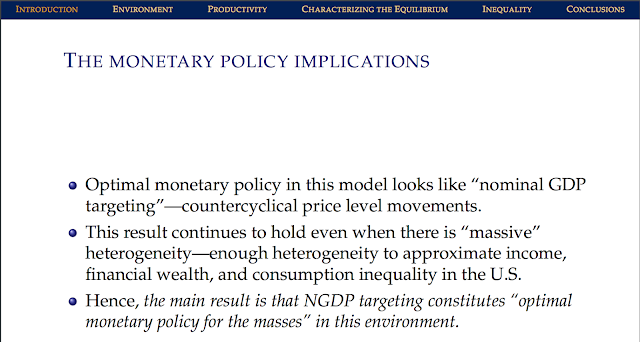 Frances Coppola makes similar observations in earlier posts on 100 percent reserve banking.